What's in a name? That which we call a rosé? This is my first, and I suspect not my last, blog post about Rosé, a wine style that Provence quite rightly dominates. And comparisons with a summer's day are inevitable. 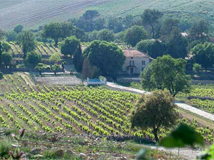 Provence historically has been regarded as too sunny for supreme quality viticulture! This is of course fantastic for people living here, but less so for the grapevine. It's not just temperature - there are plenty of hotter places where wine is made - but an excess of sunshine can make the grapes go over-ripe before sufficient sugars have built up in them. This is the reason why, historically, a lot of the grapes here are made in to Rosé (in effect a white-style wine made from black grapes, if you think about it). Even a little further west, in Languedoc, the dominance is for red wines, partly because it is cooled by so much more wind. As anyone who has been to the beaches near Narbonne can attest! Provence is pretty-much the only place in the wine world where Rosé has always been taken seriously. Black grapes that may go over-ripe if left to full maturity, thus producing over-alcoholic raisiny red wines, can instead be picked a little earlier, and made into rosé. This captures more freshness, more red fruit flavour than black, limited colour or bitterness, and less alcohol. Apart from isolated pockets in northern Spain (for the same reason), Provence is the only place where the best vineyards are given over to Rosé production. Everywhere else - in a gargantuan nutshell of a generalisation - rosé is what you do with black grapes that have got mildew or gone mouldy. Make such fruit into red wine and the mouldy flavours will survive the process. Make it pink, and they won't. Traditionally, you would stop the fermentation to leave some sweetness in - a spoonful of sugar after all helps the medicine go down. This is why most New World rosé is, or certainly has been, so awful. It is now changing, and we have Provence to thank for that too. The fact that Provence is so adept at making great dry rosé wines very beautifully dovetails with the local food. Flavours of olive (from simple oil on a pan bagnat right to intense tapenade) really prefer more flavour than white wines can afford, and yet benefit from being accompanied by something cold. Ratatouille, and other intense tomato flavours, are similarly hard to match with a big red wine, but rosé works well because of its crispness. Extracting colour and flavour from the skin of the black grapes – but without also getting layers of harsh, bitter tannins - is a real art, and accounts for why rosé can run from the extremely cheap to the very expensive. One of the best grape varieties for accomplishing this is Grenache (Garnacha in Spain) which can provide lovely strawberry flavours whilst also giving a fresh, nasturtium leaf pepperiness and spice. 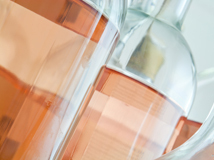 The hallmark that Grenache leaves behind is a distinct orangey tint to its hue, and this, coupled with a paleness of colour (indicating judicious use of skin contact) are the signs to look for in a Provence Rosé. Other parts of the world however use different varieties, and the results may be much deeper and redder without the wines being any the worse for it. 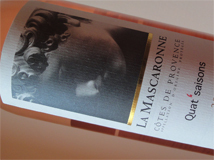 One current favourite Rosé is Château La Mascaronne Quat'Saison Rosé 2013 At the heart of the Côtes de Provence appellation, Château la Mascaronne is at a relatively high altitude, which enables them to ripen fully their grapes for rosé while retaining elegance. The flavours are of strawberry and nectarine, with a herbal freshness and excellent crisp finish. Thirst-quenching and delicious. 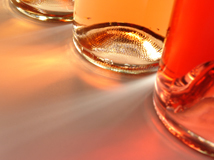 I can’t help thinking that more rosé will pass my lips this summer, and of course I’ll let you know!